LILONGWE, Nov 12 2014 (IPS) - “We are underpaid, have no guns and in most instances are outnumbered by the poachers,” says Stain Phiri, a ranger at Vwaza Marsh Wildlife Reserve — a 986 km reserve said to have the most abundant and a variety of wildlife in Malawi — which also happens to be one of the country’s biggest game parks under siege by poachers. Phiri’s fears probably sum up the reason why there has been a surge in poaching of elephants tusks and rhino horns in southern Africa in recent years. “We can’t fight the motivated gangs of poachers who are heavily armed and ready to kill anyone getting in their way,” Phiri tells IPS. He says he is paid a monthly field allowance equivalent to about 20 dollars dollars, which is not enough to take care of his family of six. “My colleagues and I risk our lives everyday protecting wildlife and it seems we are not appreciated because even when we arrest poachers, the police release them,” says Phiri. Malawi’s Wildlife Act, he says, also needs serious amendments to empower and protect ranges and to also impose stiffer penalties if the government is serious about tackling wildlife crimes. Phiri’s story resonates across southern Africa and gives insight into the challenges the region is facing maintaining transfrontier parks and managing wildlife crime. TRAFFIC, a wildlife trade monitoring network that looks at trade in animals and plants globally, says well-equipped, sufficiently resourced rangers are needed on the ground to protect the animals and prevent poaching in the first instance. Dr Richard Thomas, the global communications co-ordinator of TRAFFIC, tells IPS that most countries in southern Africa have increasingly become the target for poachers because it is a region that has the most rhino and elephants in the world. “Southern Africa is home to more rhinos than any other region in the world, with around 95 percent of all white rhino and 40 percent of all black rhino,” he says. According to TRAFFIC, 25,000 African elephants were killed in 2011, while 22,000 were killed in 2012 and just over 20,000 in 2013. This, TRAFFIC says, is out of a population estimated between 420,000 and 650,000. Last year, Zambia lost a total of 135 elephants to poaching. In 2012 the country lost 124 elephants and in 2011 96 elephants were killed by poachers, according Zambian Tourism and Arts Minister Sylvia Masebo. The same is true for Mozambique. The country’s local media have quoted Tourism Minister Carvalho Muaria as saying that the elephant population has declined by about half since the early 1970s. There are currently only about 20,000 left. The Niassa Reserve, an area of 42,000 square km and home to about two-thirds of Mozambique’s elephants, now has about 12,000 elephants. Poachers killed 500 elephants last year and have wiped out Mozambique’s rhinos, Muaria says. 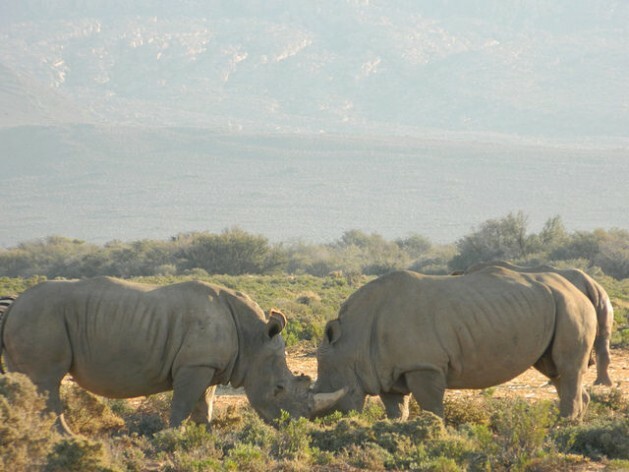 TRAFFIC says between 2007 and 2013 rhino poaching increased by 7,700 percent on the continent. There are only estimated to now be 5,000 black rhino and 20,000 white rhino. Last month, South Africa reported that it had lost 558 rhinos to poachers so far this year. But not all hope is lost. Southern Africa is responding to the threats to its wildlife by collaborating between countries that share borders and protected areas for wildlife. A case in point is this year’s anti-poaching agreement between Mozambique and South Africa, which aims to stop rhino poaching mostly in the Kruger National Park, which shares a border with Mozambique. The two countries agreed to share intelligence and jointly develop anti-poaching techniques to curb rhino poaching. Mozambique, said to be a major transit route for rhino horn trafficked to Asia, this year approved a new law that will impose heavy penalties of up to 12 years on anyone found guilty of poaching rhino. “Previous laws didn’t penalise poaching, but we think this law will discourage Mozambicans who are involved in poaching,” Muaria tells IPS. South Africa, according to press reports, is also considering legalising the rhino horn trade in an attempt to limit illegal demand by allowing the sale of horns from rhino that have died of natural causes. Ten years ago the 15-member SADC regional block established the Food, Agriculture and Natural Resources (FANR) directorate. Since then regional protocols, strategies and programmes have been developed and passed, among them the SADC Transboundary Use and Protection of Natural Resources Programme. Under the SADC Transboundary Use and Protection of Natural Resources Programme is the Regional Transfrontier Conservation Area Programme (TFCA) and Malawi and Zambia have benefited from this arrangement so far. Malawi’s Minister of Tourism and Wildlife Kondwani Nakhumwa tells IPS that the Nyika Transfrontier Conservation Area project has helped reduce poaching in Nyika National Park, the country’s biggest reserve. The Malawi-Zambia TFCA includes the Nyika-North Luangwa component in Zambia situated on a high undulating montane grassland plateau rising over 2000m above the bushveld and wetlands of the Vwaza Marsh. During summer a variety of wild flowers and orchids bloom on the highlands, making it one of Africa’s most scenic views unlike any seen in most other game parks. “Through the project, Vwaza has managed to confiscate 10 guns, removed 322 wire snares and arrested 32 poachers,” Nakhumwa tells IPS. Humphrey Nzima, the international coordinator for the Malawi-Zambia TFCA, says that since the project was launched there has been a general increase in animal populations. “Significant increases were noted for elephant, hippo, buffalo, roan antelope, hartebeest, zebra, warthog and reedbuck,” says Nzima citing surveys conducted in the Vwaza Marsh and Nyika national park. The escalating poaching crisis and conflicts on the ground occurring in many national parks across Africa will be one of the topics of discussion at this year’s International Union for Conservation of Nature (IUCN) World Parks Congress 2014, which is currently taking place in Sydney, Australia. “In Sydney, we will tackle these issues in the search of better and fairer ways to conserve the exceptional natural and cultural richness of these places,” says Ali Bongo Ondimba, president of Gabon and patron of the IUCN World Conservation Congress.